November 29th is National Square Dance Day, a great day to get out and do-si-do! Did you know that square dancing is also the state dance of Illinois? In 1990, Governor Thompson signed a law that named Square Dancing, the official American folk dance of Illinois. Square dancing gained a lot of popularity in the United States but it has roots that reach back to Europe in the 15th century. You can learn more about square dancing here or check out our books related to square dancing. We’ve reached that middle stretch of Nanowrimo, and November. Today’s word count goal is 26,666 words, and for once I am exactly on track. But regardless of whether you have reached the halfway point in your novel and written around 25,000 words or if you just have a couple thousand written you should be proud of yourself. NaNoWriMo participants go through their own long, dark nights of the soul halfway through November. If you haven’t experienced one already, you will very soon…[But] the back half of NaNoWriMo has always been a place where writers get their second winds. As long as you keep working, your potatoes will turn back into charismatic protagonists, and your imagination will build a path right out of these mid-month doldrums. Chris Baty gives even more helpful tips in his book, No Plot, No Problem which you can borrow from the library. So don’t give up! Let’s stay on track and push past these mid-month blues! 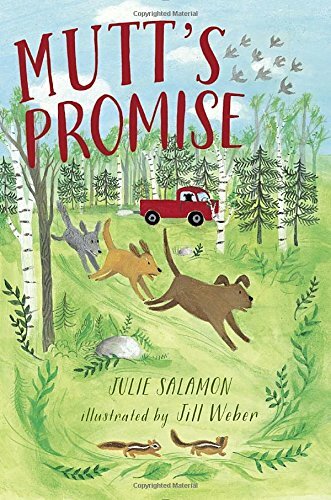 If you enjoyed the book “Shiloh,” then you will like ” Mutt’s Promise” by Julie Salamon. This is the story of Luna and Chief, two brave dogs who survive a puppy mill before they find love.